We have reached the end of August, 2009 in Alberta, Canada. The province of Alberta, just north of Montana, in western Canada, in the minds of many people lies in the land of the 'Great White North'. Well, not always. We had just survived one of the hottest, driest summers on record in central Alberta while our neighbours further south in the province were making plans to build the Ark. Welcome to Alberta; the weather can be like that here. But, despite the unusual weather conditions, for many of us who own sporting spaniels, it was business as usual. We completed our training and now it was time for the fall spaniel field trial season. And, it was going to be a good one! Within a one month period (between September 3rd and October 4th) spaniel trialers in Alberta could compete in as many as nine open and amateur trial days, hosted by four different Alberta spaniel clubs - all within an area of less than 400 kilometres distance (242.42 miles for you 'miles' folks). There are few places in North America where you can attend that many field trials in this relatively small area - and you could do even more if you wanted to drive further and visit our nearest neighbours in Saskatchewan! So, it was not just the weather, but also the spaniel action that was hot in the fall of 2009. It is now Saturday afternoon, September 18th, 2010, and I am at our Edmonton field trial on the farm of our host, Rodney Jack of Windy Plains Kennels, in central Alberta. I just bombed out in the second series with both my dogs. After finishing the first series this morning, one of my dogs was caked with ice from running through the thick, frosty cover - a far cry from last year's hot weather. Since I have nothing better to do now, let me give you a brief overview of our spaniel sporting events in Alberta and how we compare to the rest of Canada. Alberta is a beautiful province! It has landscape extremes and diverse vegetation - and let's not forget the weather. I have hunted ruffed grouse in Meander River (58 degrees North latitude) in bush so thick you often can't see your dog (or the bears). Also pheasants, sharp-tail grouse, and Hungarian partridge north of Medicine Hat on the prairies and river valley bottoms - and everything else in between. 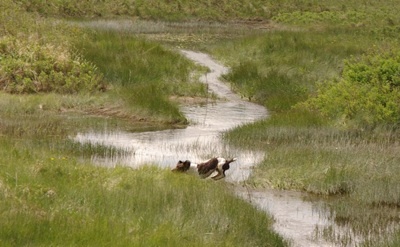 Real testing grounds for any spaniel! At length the Rocky Mountains came in sight like shining white clouds in the horizon, but we doubted what our guide said; but as we proceeded, they rose in height their immense masses of snow appeared above the clouds. 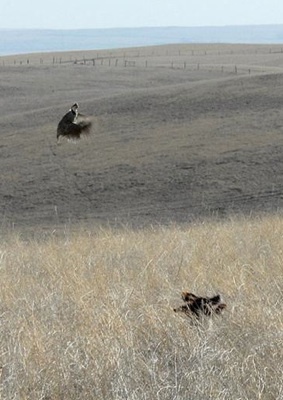 To get to this point in sporting spaniel competitions in Alberta was not easy. It has taken a lot of work, organization, and patience by many very dedicated people, over many years. Needless to say, along the way there have been some growing pains. But, upon reflection, the end-product is pretty darn good. The two original Alberta clubs, the Calgary Springer Spaniel Club (formed in 1969) and the Edmonton Springer Spaniel Club (started in 1974), formed the original basis for training sporting spaniels in Alberta. Today, the Calgary Springer Spaniel Club has the largest membership of any club in Canada. Like most spaniel enthusiasts across North America, Alberta club members shared a common goal: to breed and train good spaniels and to hunt those dogs in many parts of the province. 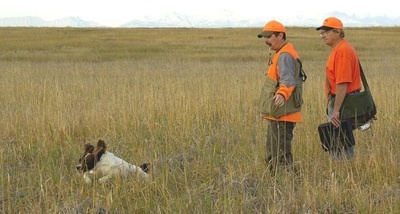 The clubs soon realized that in order to reach the highest standards of the sporting spaniel breed, licensed field trials sanctioned by the CKC (Canadian Kennel Club) were necessary. For many years, both clubs held four events per year - two in the spring and two in the fall - each consisting of Open All-Age, puppy trials and shooting dog stake. Sometimes entries in some of those early trials were pretty meagre. I remember competing with my first spaniel in the mid to late-1980s when we often had to scramble to come up with our minimum entry (eight dogs then) to qualify under CKC rules for a licensed field trial. Those days of two clubs and small field trials in Alberta are pretty well gone (although there are some occasional hick-ups). Just this fall the Prairie Spaniel Club had a 52 and a 45 dog entry in their two Open-All Age events. Two more spaniel clubs entered the fray in Alberta in recent years. 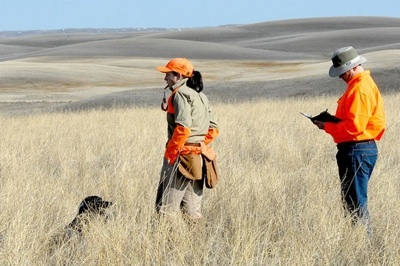 The Prairie Spaniel Club (1989) operates out of the east-central part of the province, near Lloydminster, Alberta. Although small in membership, the club has managed some very big field trials. 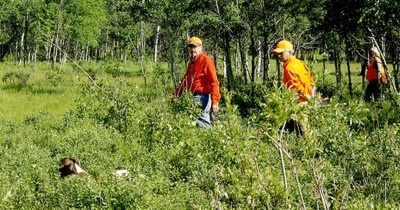 The Eastern Slopes Spaniel Association (2002) operates in the Greater Calgary region. Sometimes, both Calgary-based clubs run trials on some very challenging creeks valleys. As the size of the entries in Open All-Age field trials increased over the years, there was a push, primarily from some members from Alberta, to hold Amateur field trial events in Canada. In 2009, the first Amateur All-Age field trials were hosted by various clubs across the country. **Number does not include the two Canadian National events hosted by Alberta. One would think that with the introduction of amateur stakes in Canada, the numbers of Open entries might decrease as the number of amateur entries increased - in other words the amateur folks would compete in amateur trials and the pros would compete in the Open All-Age stakes. Currently, this is hardly the case! The amateur stakes entry numbers are not any larger than the Open All-Age stakes. In fact, they generally are smaller in size. This is because many of us 'amateurs' in Alberta, and other parts of Canada, feel we can run against anyone in the spaniel game, so we compete in both events. And, many (but certainly not all) of us believe that competing against the best dogs and the best handlers sets the highest standards for the breed - whether they be in the Open All-Age or Amateur stakes! Just to make my point, look at the CNSFTA field trial numbers for 2009. A total of 243 dogs competed in 11 Open All-Age events in Alberta. Of that number 199 or 81.9% were amateur dogs run by amateur handlers. And how did they fare? Of the 44 placements up for grabs, amateur competitors took 35 placements or over 80 percent, simply because of their sheer numbers of entries. However, if those figures are adjusted according to the number of pro dogs and amateur dogs competing, then 44 pro dogs took nine placements (26.5% efficiency) while 199 amateur dogs took 34 placements (17.1% efficiency). If you support the amateur events you would say, "See, those pro-trained dogs are more successful than amateur-run dogs and we can't compete against them." And, if you support Open All-age competition you would point out those amateur dogs still took over 80% of Open All-Age placements. The numbers could support any argument anyone wishes to make. Of course, there will be plenty of debate over this issue in the years to come. That's enough for the stats - those who are interested can look at the numbers the CNSFTA website. The CNSFTA (Canadian National Spaniel Field Trial Association) keeps yearly stats that make up the data for above tables. These data are wonderful because we can track our trials and entry numbers over the years and how the dogs and competitors are doing. The number of field trials in the province in 2010 is lower than usual because both Canadian National events are being held in Alberta this year. It's September 19th, 2010, day two of our Edmonton trial. I am sitting in my truck waiting for the call-backs for the third series. Today I didn't bomb as badly as yesterday. After a lovely fall day yesterday, the weather today is not good; the truck heater is on and it's raining, close to snowing. Our club had a 28 dog entry yesterday and 22 dogs entered today. And, with the cool weather, the birds were flying and the dogs were smokin'. Often we get entries from outside the province and from the U.S., but this entry was primarily all-Alberta (one U.S. competitor). And, it is that strong Alberta base that is necessary to keep us going from year to year. The judges are just tallying up the numbers and the call-backs are coming shortly. I hope very soon - the weather is tanking as the day progresses. Our Edmonton trial is the last one in Alberta before the Canadian Amateur National (October 2nd - October 4th) and Canadian Open National (October 9th - October 12th). Those two events will be hosted by the Eastern Slopes Spaniel Association and the Calgary Springer Spaniel Club, respectively, in the southern part of the province. Because this is the first year an Amateur National is being held in Canada, the entry will likely be small, but in all likelihood the competition will be stiff. There are some excellent amateur dogs and handlers out there, who do equally well in open all-age events. The Canadian National Open, on the other hand, will be a relatively big event (between 80 - 90 dogs) with people and dogs coming from all over Canada and the northern and western U.S. The Calgary English Springer Spaniel Club has hosted this event many times over the years and always puts on a great show; I am sure this National will be no different. The event will be held on private land of two long time Calgary Club families, the Bratruds and the Holmes, who bought land primarily for running spaniel field trials. Now, those folks are serious about their spaniels! It's been another good Alberta trial, despite the changing weather conditions. As I look back over the last 25 years of trialing in this province, I have enjoyed many great Alberta days spent competing, judging, watching some great dogs, great handlers and just socializing with some wonderful, dedicated people! For those of you who compete with sporting spaniels and have not experienced our trials firsthand, come and visit us, give it a try. We have folks from all over Canada and the U.S. attend our events. Many keep coming back. If you are not familiar with Canadian field trials, for more information go to the CNSFTA (Canadian National Spaniel Field Trial Association) web page where all the trials, premium lists, and placements are listed for every year. There, you will also find the high point amateur and open dogs and puppies, listed for each year. Oh, I have to go now. I was just called back to the third series with one dog and will compete against 11 other dogs out of 22 starters for our Sunday event. Wow! Things are heating up again. Happy Trialing! Hope to see you soon! Acknowledgements. I would like to thank members of all four Alberta spaniel clubs for supporting this article. arry Garner checked my stats, Gabriella Prager edited a draft, and the great photographs are from the large collection put together by Ian Forrester, Calgary English Springer Spaniel Club. The contents and opinions expressed in this article are solely those of the author. Heinz Pyszczyk, and his wife Gabriella Prager - along with their eight cats, four springers and various other critters that roam the acreage - operate Blackgold Kennels which is located just east of Leduc, Alberta. The author got his first springer spaniel in 1984 and since then has trained, hunted and competed with these wonderful dogs.